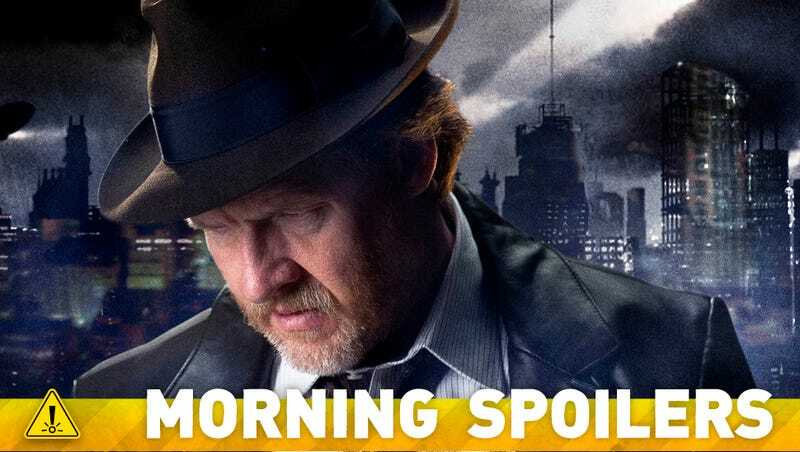 How Far Will Jim Gordon Fall on Gotham? Is Simon Pegg joining the new Star Wars movie after all? And could Amazing Spider-Man 3 be delayed? Michelle Forbes joins the cast of another genre show. Plus, new looks at the Game of Thrones finale, Earth to Echo, and Transformers 4. Spoilers now! The current schedule for Star Wars movies, pieced together from confirmed announcements and rumors, has Episode VII coming out in 2015, the Gareth Edwards-directed stand-alone spin-off (written by Gary Whitta) following in 2016. Then Episode VIII, IX, and then Josh Trank will do another spin-off. He's a truly honest man. The last honest man in a city full of crooked people. It's very tricky nowadays to play a true, honest-to-goodness hero. Everybody is so cynical of people's intentions. What's interesting about him is he comes into this city that he hasn't lived in for two decades, since he was a kid, and has fresh eyes to a world he doesn't actually know. He thinks he knows it, and his journey will be to figure out how to make it better both for Gotham and himself without completely [losing] the moral standing that he has. He's not an anti-hero, he's a true hero — but he will have to compromise. He won't [be able to maintain his. And that's one of the things we talked about very early on. This is not a Batman-from-the-'50s kind of show, with moral duality in black and white. In this world, everybody lives in the grey. Everybody is on the take. Everybody is compromised. There is no way he'll emerge unscathed from that. How does he hold onto the thread of his mortality while getting things done? Season 2 is going to be very, very different, obviously, for many reasons. The Ark is on the ground for the most part. The grown-ups are on the ground and we're really beginning to widen the scope of the show and explain this world that these people from the Ark have been dropped into. So in Season 1, we lived in perspective almost exclusively, at least on the ground, of those 100 kids, and so we didn't know anything. They've only been on the ground for something like 29 days by the finale, so we know as much as they do as an audience. Now they're scattered and they're in various parts of this world, and we begin to learn more about that world as they do. So that's one of the things I think we're going to lean into more — the sweeping adventure of it. And then I think we told the story at a really, really rapid clip last season, which I think is an advantage for sure — it's entertaining and the story doesn't lag and it's a sort of rip-roaring adventure. But some of that came, at times, I think, at the expense of real character exploration. And so I think we'll probably want to slow down just a little bit, just enough to really mine who these people are and what they're going through and how it's changing them and things like that. Which isn't to say we're going to spend that much more time on the soap opera of it at all. Alden finds himself the target of fresh accusations; Anne finally discovers the truth.